A 2-0 home win over Clitheroe last night means Brighouse Town are safe from the drop in Evo-Stik North. Adam Field gave them the lead after 30 minutes at the Yorkshire Payments Stadium. The ball was whipped back in following a corner and headed down by Aaron Martin to Field, who knocked it under the keeper. Martin also had a hand in the clinching goal with 12 minutes left, flicking the ball on for substitute Danny Naidole, who struck it into the bottom corner. Victory lifted Vill Powell’s side 10 points clear of bottom club Goole with three games left for each side. Only one club will go down and Town leap-frogged Skelmersdale into third from bottom position. 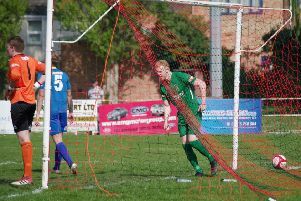 It was Brighouse’s third win in five games and they complete their season with three games in eight days, starting at home to Prescot Cables on Saturday.